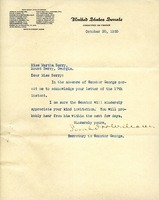 Senator George's secretary (whose name appears to be "Sarah...") writes Martha Berry an acknowledgement of an invitation she sent the senator. She says that Martha Berry should hear from him in the next few days. 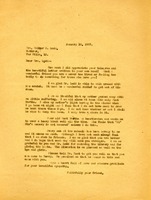 Martha Berry thanks Ladd for her recent correspondence. She confides to Ladd that she misses her mother, but is thankful that she passed away with little suffering. She thanks the Ladds for endowing Memorial Library, and expresses hope for their improved health.